Click on the links to see the Challenger Learning Center In the News! NASA Administrator Charlie Bolden launches rockets with the students in our Rocket Camp (June 18, 2012). Pictures of the day: Aerospace Career Day, General Aviation News, November 27, 2016. Schools Stars (Aerospace Career Day), Columbia Star, November 25, 2016. 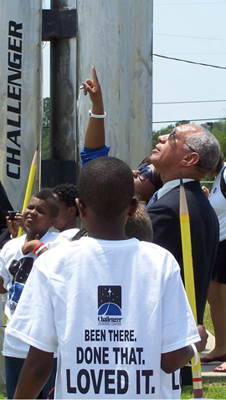 ‘To infinity and beyond’: Richland One launches summer space camps, ColaDaily.com, June 4, 2016. Happy 20th Anniversary! Click here for highlights of our Anniversary Celebration! From STEM to space: Richland One Challenger Learning Center celebrates 20 years, ColaDaily.com, February 29, 2016. Cause for Celebration: Challenger Learning Center Anniversary, This Week, February 17, 2016. Cause for Celebration, Straight from the Supe, February 13, 2016. Richland One to celebrate 20th anniversary of district’s Challenger Learning Center, Millennium Magazine, February 11, 2016. Richland One Challenger Learning Center 20th Anniversary, Cola Daily, February 11, 2016. Richland One celebrates 20th anniversary of Challenger Learning Center, The Columbia Star, February 11, 2016. Challenger Center celebrates 20 years of space training and imagination in Columbia, The State, February 11, 2016. Challenger Center aims to launch children into aerospace workforce, Columbia Regional Business Report, December 14, 2015. Challenger Learning Center hosts Aerospace Career Day, General Aviation News, November 30, 2015. Students learn about Aerospace Industry, WLTX, November 13, 2015. Aerospace Career Day gets students interested in aviation industry, ColaDaily.com, November 14, 2015. SC Aerospace News, SC Council on Competitiveness, June 29, 2015. Hubble @ CLC-RCSD1, NASA, April 24, 2015. W.A. Perry Middle School students sit in replica of Friendship 7, The Columbia Star, December 19, 2014. Friendship 7 Space Capsule Lands in Columbia–for the afternoon, The State, December 11, 2014. Challenger Learning Center hosts career day, General Aviation News, November 18, 2014. The Challenger Learning Center sponsors fourth annual Aerospace Career Day, Millennium Magazine, October 29, 2014. Young Minds Take Flight at Astronaut Academy, The State, June 11, 2014. Challenger Learning Center Offers Summer Camps, The Columbia Star, June 6, 2014. T.S. Martin Scholarship Winner, Carolina Panorama Newspaper, June 5-11, 2014. Richland One Challenger Learning Center Opens Registration for Summer Robot, Rocket Camps, ColaDaily.com, June 1, 2014. Challenger Learning Center Tours Boeing DreamLearner, Aerospace News, June 2014 – Volume 1. Space Day at Roper Mountain Science Center, Kidding Around Greenville, May 7, 2014. Outsmart Your Kids: Summer Camps Keep Kids Learning, Free Times, March 27, 2014. Family Space Night, The Week In A Blink, February 9, 2014. Aerospace Career Day at the Challenger Learning Center, WLTX, November 15, 2013. S.C. Astronaut Plaques on Display at Challenger Learning Center, The Columbia Star, September 6, 2013. Smart Minds, Healthy Bodies, Free Times Parent, Summer 2013, page 6, Summer 2013. Liftoff for SC State Museum Expansion, Examiner, October 12, 2012. SC State Museum Celebrating $23 Million Expansion, Midlands Connect, October 11, 2012. SC State Museum Celebrating $23 Million Expansion, AP State Wire News (The Sacramento Bee), October 11, 2012. Students Say Science and Camp Go Together, WLTX, June 18, 2012. General Bolden launched “The Golden Bolden” and autographed it. 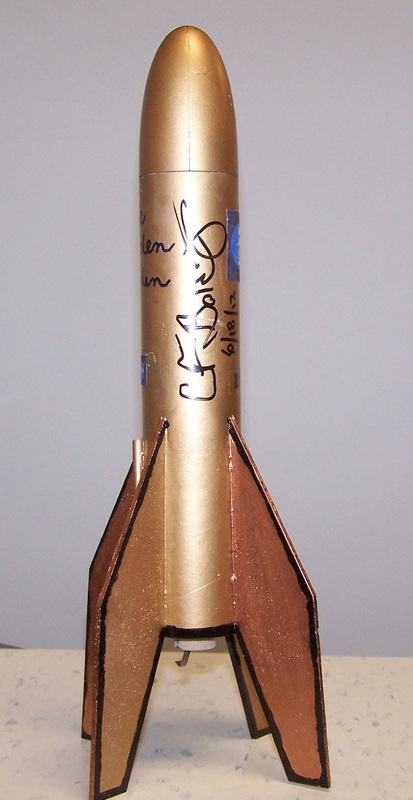 “The Golden Bolden” is on display at the Challenger Learning Center.